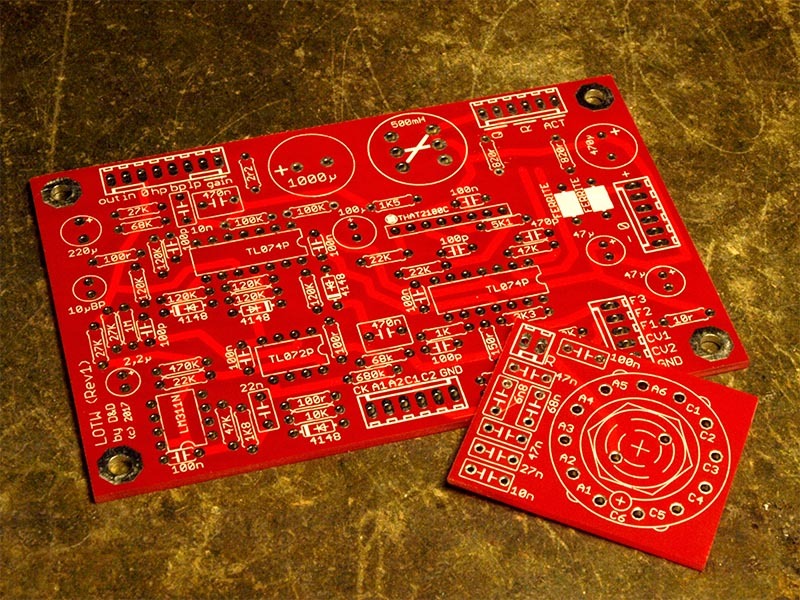 I'm working on 5U format but the PCBs I ordered are 10 x 6,4cm, so could maybe also fit eurorack.. I'll appreciate your feedback.. cheers! Nice! It gets really good around 8 minutes in. Will this be available for purchase in MU format? looks like a great module..
personally I would like the option of a bit heavier/thicker distortion and slightly more resonance.. so it ticks over into slightly "nasty" territory as well..
Will this be available for purchase in MU format? Hey! I ll provide PCBs (once I've tested them), and a MU/Dotcom 5U frontpanel design in pdf format (2 units width), along with a bom and wiring/soldering info. saint gillis, please design a good BBD delay (with modulation) for MU format. It will be great! Yes I choose not to include a feedback circuit, but we can go really nasty, I'll make a special sample for you! Yes, of course. But an interest in true analog delays is higher too. It will be great to have a module in MU with sound and features similar with stompboxes but with modular level IN and OUTs signals. My favourite analog delays are: Maxon AD9 (and AD 900), EHX DMM (old big version), Diamond Memory Lane and MXR Carbon Copy. Just curious if anyone has went ahead and built one of these. And if so how has it worked out for you. From the video it does sound pretty interesting. The build looks fairly straight forward. God I have to work on the V2, when the "action" knob is full "deep" (CCW) there is a very very high gain retroaction that brings a bit of noise on smooth signals... I have to see if I can improve this but it looks like inherent to the design, lot of work right know but I'll work on it asap. And yes I'm also looking forward to hearing feedbacks from builders ! That's good. Wasn't sure if this was still alive or not. Wasn't a whole lot of feedback since your first post about this. I'll keep my eye on it. From they video they sound so great that I re-watch from time to time just for fun. Maybe this question should be its own thread, but what's the technical difference between a Wah Filter and an a Resonant LPF? Is a Wah just a specifically voiced LPF? I know there's many different Wah circuit topologies, but is there a particular characteristic that creates the Wah vocal quality? 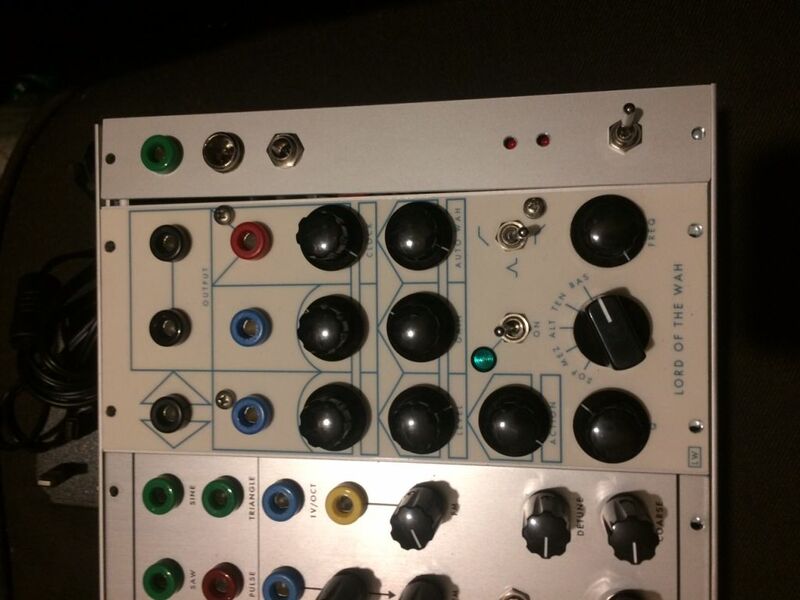 Of the 5 filters I have in my modular, the only one that has a Wah-like quality to it is the Fun VCF.... in which I know the 2 poles are somewhat detuned from each other. A wah-wah is a bandpass filter with the resonant frequency going from very low to very high, going "WWwwaawww". It uses an inductor and a capacitor driven by a feedback path to make this capacitor variable and changing the resonant frequency of the LC filter formed by the 2 components. So it's basically a bandpass filter. On the module I've added a low pass and a highpass mode allowing respectively more low or high frequency to pass through but it is still a kind of bandpass filter. The saturation of the inductor (inductor with a ferrite core) generates amazingly rich harmonics. The documentary movie "Cry Baby - The Pedal that Rocks the World" is also worth watching ! It uses an inductor and a capacitor driven by a feedback path to make this capacitor variable and changing the resonant frequency of the LC filter formed by the 2 components. So it's basically a bandpass filter. Wah, Phaser, Flanger, Chorus, it all seems related soundwise. Although the way it's created seems to differ. What's exactly the difference I don't yet understand. Flanging was originally done with tape. Perhaps there are different paths to come to the same or more or less the same outcome? Thought you might like to see my 4U version built by Charlie Kerr (Loudest Warning) for me in a Serge paperface style.